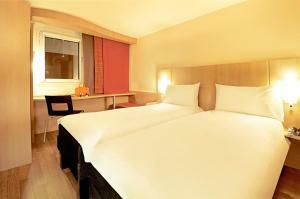 Located in the Batignolles District of Paris, ibis Paris Berthier 17ème offers a fitness centre, 3 on-site restaurants and guest rooms with free Wi-Fi access. It is just 300 metres from Brochant Metro Station (line 13). 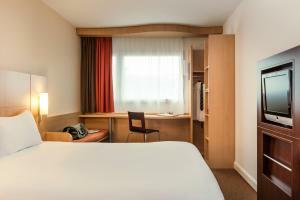 All of the rooms at ibis Paris Berthier 17ème have a desk, a satellite TV and a private bathroom with a bath or a shower. A buffet breakfast composed of sweet and savoury dishes such as eggs, fruit salad, yogurts and juices is served every day. Pastries baked on site and fresh French Madeleine cakes are also on offer, as well as a hot beverage and a piece of fruit to take away. Outside of regular breakfast hours guests can also enjoy a lighter option, available from 04:00. There is a 24-hour snack bar and guests can choose to dine at 1 of the 3 on-site restaurants. Children under 12 years old can also enjoy breakfast or half-board rates for an additional charge. You can relax in the indoor swimming pool, sauna and hot tub, all available at an extra cost. Additional facilities are included such as meeting facilities. 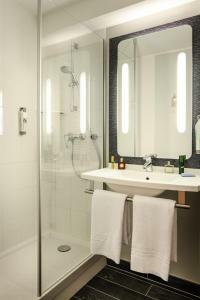 Private, secured parking is possible on site for an additional fee, and this ibis hotel is 3 km from Montmartre and 4 km from Gare du Nord Train Station. It is a 20-minute metro ride from Galeries Lafayettes and from Palais des Congres. Please note that the credit card used to make the reservation must be presented at the check-in. Please note that children under 12 years old can enjoy breakfast at a reduced rate. Guests are required to show a photo identification and credit card upon check-in. Please note that all Special Requests are subject to availability and additional charges may apply. 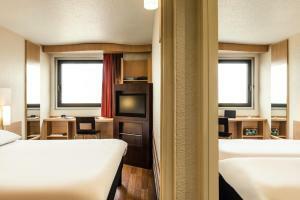 This room has a desk, a satellite TV and a private bathroom with a bath or a shower. Rate: € 65.50 ... € 294.00; select dates below to get current rates. Rate: € 64.00 ... € 294.00; select dates below to get current rates. Rate: € 59.33 ... € 284.67; select dates below to get current rates. 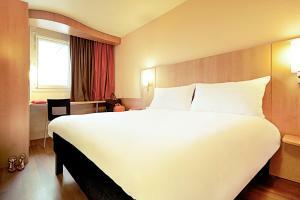 This twin/double room has a private entrance, satellite TV and air conditioning.